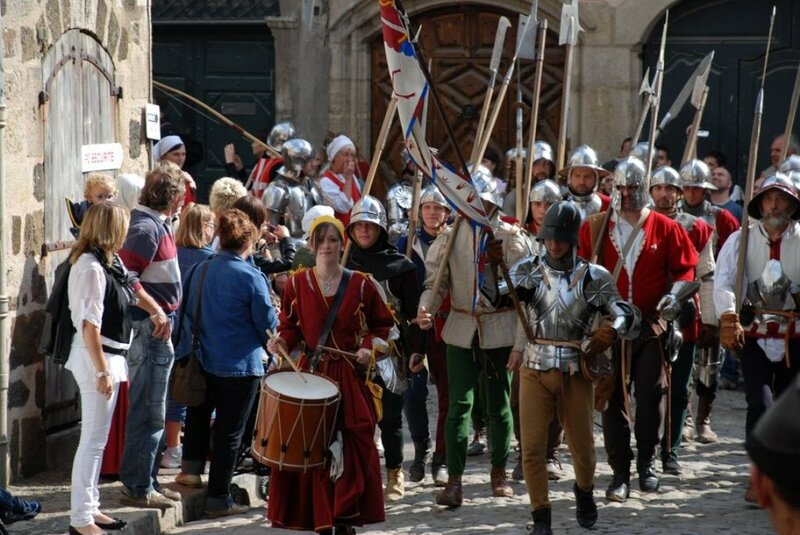 The company meets Mercenaries Velay pageant enthusiasts, specializing in the military and artillery from 1450 to 1525. Founded in 1989, it offers entertainment in the form of military camp, or in enclosed places (watchtower, armory, …) in the context of festivals, shows and historical events. A major concern is given to all details and the contact with the audience. Primarily because we like to share our passion. La Compagnie des Mercenaires du Velay is composed of about thirty people who are all historical re-enactment enthusiasts and they are specialized in the military life and the artillery from 1450 to 1525. Created in 1989, it proposes animations, like military campments for historical festivals or for private animations (castle, battles, parades …). For a fee, the captain has around him halberdiers, harquebusiers, gunners, camp followers and chambermaids. We all live, day as well as night, in a campment especially studied to let visitors see all the view of its organization. Its colours are the blue and the red, the shield represents a stag. The armed men practise the halberds and harquebus handling, while camp followers are around cauldrons and prepare delicious recipes of the time. The chambermaids assure to each man help to dress them with their heavy armours, and to take them off at the end of the day. Children, when they are not on duty, play with stilts and learn the halberd’s using. The campment counts several tents (the Burgundy’s, the powder’s, the captain’s, the soldiers’), a fire, an empty area to train to halberd and harquebus handling. An important care is given to the details and the necessary explanations are given to the visitors. Each costume (except the armours) are made by the association members, based on engravings and paintings from the Renaissance. Members are all passionate and enlightened amateurs. Powder using is undoubtedly dangerous for a neophyte.That is why the company has a qualified pyrotechnics expert.